We also remind you we broadcast live through Vokle, when we record the show. Maybe you should come listen to us live, and ask us and/or our guest(s) questions! Break Song: Death by Holiday by The Vanished. Notes: Penguicon, Holiday Wars Kickstarter! There was some contention after the recorded show, in regards to some comments during the discussion. Please check the first comments for for those details from DJ Coffman and Jason Embury. 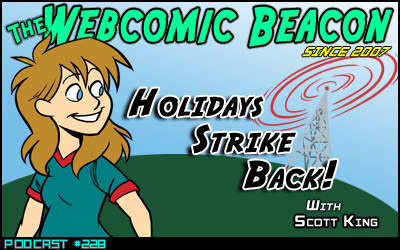 WebcomicZ is a webcomic list and resource site. Not quite in its prime any longer, but certainly still draws traffic. In short, there is an effort behind the scenes to bring it back (and it includes a spendy, re-coding of the entire website). 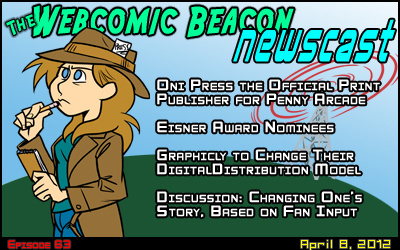 Since the beginning of The Webcomic Beacon Network, with The Webcomic Beacon, it has been a mission to bring knowledge and resources to creators. It’s been a labor of love, coupled with [undisclosed amount] of out of pocket funding by Fes. Today’s WCBN crew consists of 15 active members, working voluntarily. 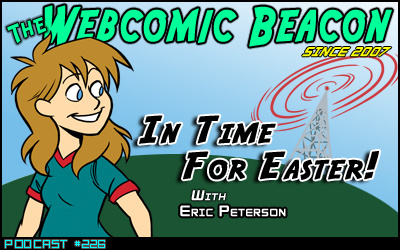 As it stands, WebcomicZ stands to be a source of revenue through ads (because of the traffic). Ironically, the money earned so far on it will be used to recode the whole thing for better functionality, among other very good reasons. But the site still works fine as it is, and can serve creators just the same. Bottom line is that we need content! 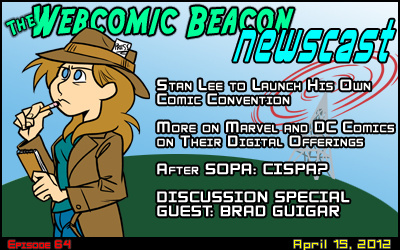 We are already making efforts to crossover content with The Webcomic Beacon Newscast, and possibly with other WCBN shows. I can’t promise anything more than exposure at point. But I can promise that no one is making money off of anything right now; except for the future website programmer, as the current ad income is being saved for that (plus out of pocket). As I said, it’s basically a labor of love right now. At this time, the best I can offer are image links paired with article written, and podcast ad spots on WCBN programming. I am looking for comic reviewers. Reviewers that hopefully match the spirit of The Webcast Beacon Network. I will be entertaining the possibility of print comic reviewers, digitally sold comics, and webcomics. The “spirit” is mainly honest reviews, not banking on sarcastic, hateful, nor demeaning reviews for the sake of “entertainment”. We don’t need reviews of well popular comics that don’t need more publicity. We want reviews of good comics you can recommend; reviews of bad comics we can learn something from; or so-so comics that have potential. I am looking for tutorials. Original tutorials are best, but there are also a lot of good tutorials already out there. A more challenging task would be to find and collect similar tutorials, so we can link them all together in one big resource (such as “how to draw women’s breast properly” or “advertising online” guides). Or if we can collect tutorials by other categories. I’m talking links and summaries; though we may seek permission to re-post tutorials in full. I am looking for trust worthy people. Some of what I may be needing in the the coming months, are self-motivated people. People capable of doing tasks on their own. I try very much to be hands-of with created content, after ground rules are set. While I still hold the title of Executive Producer/Director/Editor, I would rather not make more work for myself. 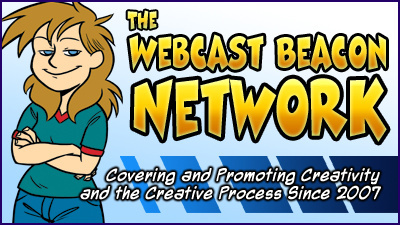 For several programs and aspects of the WCBN and WebcomicZ, other people are producing the bulk content, in their own fashions. Everyone gets a title. I am trying to handle everything as professional as possible. This may be a labor of love (hopefully not forever), but this is not merely hobby. There are a lot of ideas that can be put forth this venture. 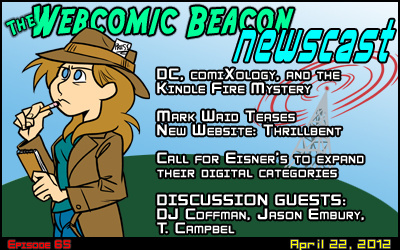 I am willing to hear all suggestions and criticism; for current or future aspects of The Webcast Beacon Network and WebcomicZ. I would like to keep doing what I started in 2007. From only 3 people, to over 20 people working on a common mission, five years in the making. Would you like to be apart of it? 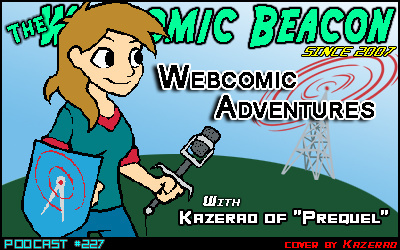 Kazerad, of the webcomic Prequel, joins Fes Works and Mark Savary to talk about his comic. Prequel is a webcomic heavily inspired by MS Paint adventures and forum adventure style, crowd-influenced story telling. It is also inspired by the video game Elder Scrolls universe by Bethesda Softworks. We had a great time with people listening live through Vokle, and asking the guest questions throughout the show. Maybe you should come listen to us live? 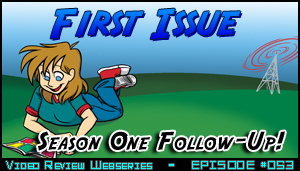 It is the END of Season One of First Issue, with our follow-up episode! Please join Fes Works, Melissa Kaercher, and Marcus A. Season 2 of First Issue will start in May, as we go back an overflowing short box of first issues. The plan is to have near-weekly shows. 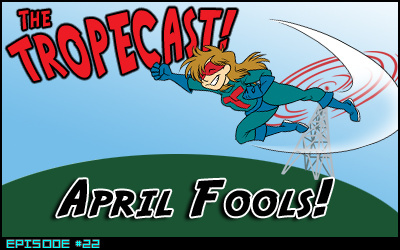 Given that the news this week was collected and recorded before April 1st we don’t know exactly who did something crazy or what it was. But we know that some webcartoonist did something and it was either awesome, offensive or lackluster. 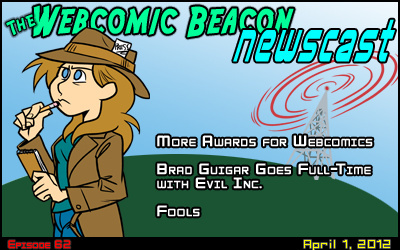 We here at the webcomic beacon newscast would like to just take a moment to either applaud, condone or say meh to the creator who thought up this amazing or horrible or half assed April fools day event. The website belonging to the person who though it up probably or a collection site that collected a whole bunch of April fools jokes.